Go beyond. 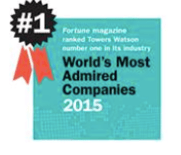 At Towers Watson, we are more than individuals. We are a community focused on helping our colleagues and clients thrive and succeed. Towers Watson is a leading global professional services company that helps organizations improve performance through effective people, risk and financial management. With 16,000 associates around the world, we offer consulting, technology and solutions in the areas of benefits, talent management, rewards, and risk and capital management. Corporate Marketing provides strategic and tactical marketing support for Towers Watson at the corporate, business and regional levels. Coordinate with lead executives to plan and execute analyst interactions that effectively convey Towers Watson messages. Help educate Towers Watson associates, particularly sales teams, on the impact of analysts on our market and how to leverage analyst opinion in sales situations.